So last week I went camping with my darling nieces, Gwendolyn and Alice, who are six and three respectively, as well as their mum Emma. Had a great time, and learned more than a few things. I learned how to build a fire when your lighter is dead, and that ten years in classrooms and libraries leads to sunburns if you’re not careful. 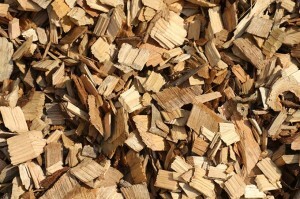 And I learned about wood chips. See, while I was laying in a hammock reading about the history of medieval magical practices, Gwen and Alice were exploring with their mum, and found a great playground near our campsite. After dinner we headed down to said playground, which was your standard sort of blue and yellow climber with children clambering all over it (I really need to get a camera or something with a camera so I can actually take pictures of these things. Seriously). It had a newish coat of paint, and a layer of fresh, almost brand new wood chips all over the bottom of the play area. The girls ran into a number of other children, and rapidly established a pecking order and played princesses and tigers while Emma and I sat near the edge and watched. And I played with the wood chips, just picking up one at a time and tossing it so it whirled through the air, seeing how far I could toss them. “What are you doing?” Emma asked me, and I felt like I needed a funnier answer than just throwing wood chips and watching the kids. “I’m searching for the perfect wood chip, but the only way to know is to throw it,” I replied. And that’s when it hit me. Let’s imagine for a moment that experiences are wood chips. From far away, they all look sort of the same, and you don’t have to pick up any of them, but if you want to look for good ones, there are a few ways to handle it. One way is to pick up the ones that look best, and see if they’re good. Some of them are perfect, but the only way to know for sure is to see them in motion, whirling through the air. If you just collect them and hold onto them, you can’t be sure. But if you toss them, you could lose them and never find them again. Another way would be to just look at the pile, and poke around a bit, but worry about getting dirty from picking them up. As I relayed that, Alice saw what I was doing, came over, and demonstrated another way to deal with it, scooping up a whole pile with both hands and tossing them all into the air. She didn’t care which ones were perfect, she just had a bunch of wood chips, and then they were flying. But then I thought again. What makes our experiences similar? What do they all have in common? They belong to us. Just like the wood chips make up the foundation of the playground, our experiences lay the foundation for our outlook. Experiences may be different, but how we treat them doesn’t have to be. We can decide to hide one and show off another, or we can decide that we’re going to treasure all of them, or use them to build something, or throw them all away. Some of these choices seem better than others. This is mostly just musings about wood chips from camping, but it’s funny how imagination can make you think of things in new ways. How do you treat your experiences? If you treat some of them differently than others, why? I was actually thinking about this the other day, from another angle. I was thinking about photographs, and videos, and digital cameras, and facebook. We now have so many ways to capture and store up our experiences and then share them with others or keep them for a rainy day when we need them again. I was wondering if all this alternative storage comes at the expense of memory. I then a few days later read about a study some people did that seemed to say just that. If people know data will be backed up digitally, they have a lower rate of retention in memory. I am not big photograph / video guy. I don't like taking pictures, or keeping them around, and they aren't all that important to me really. The litmus test for my experiences has always been my memory. I guess the way I figure it is; if I remember it, then it was important. I often like to just sit and sift through memories, like another person might old photographs. Watching old experiences shift in and out of the haze of the past, and often i have to wonder if things ever happened the way I remember them or not. Memories like photographs can or can not have strong emotions attached to them,but with a photograph, there it is, warts and all. The memory is constantly shifting and moving and probably slowly wandering away from anything the resembles the truth. I like that aspect of remembering experiences. You can add in things you learned later, and take out the stuff you don't want anymore, well to some extent. Unlike an old photograph, you can't just throw a bad memory away. As for how I treat them, I do treat some very differently that others. The bad ones, or the ones where I have failed at something i take the most seriously. I make a conscious effort the delve into (read: dwell on) them and figure out what I can learn about myself to do better next time. To be fair, some other times I just like a good wallow. The few especially good ones, I mean the REALLY good ones I save for when I need them. When I have a bad day, or need that extra kick to keep going, I can dust them off and have something good to reflect on. There are people in the past I have fallen out with or drifted away from. For each of them, I keep one special memory, so that in case I find myself dwelling on the bitter stuff that may have happened later, or the simply moving apart of people, I have that one thing to remind me that once it wasn't so and that sometimes things just change. I too have spent lots of time with those two girls and wood-chips. It was always time well spent. There's been a bunch of research into this actually. An easy example are phone numbers. Before you stored every phone number in your cell phone, how many could you remember vs now? There was an article a while back about asian kids nowadays – they've got a huge alphabet to remember and are finding that auto-complete in cell phones while text messaging has caused their spelling ability to take a downward shift. ?????????????????????????????????????????????? 0.138255627 ??????????????????????????????????????????????????????????????????????????????????????????????????????????????? . 0.331622225 ??????????????????????????????145??? . ???????4,???????????????????????? ?